Want to be the best Web Hosting Service Provider? Here's how Site24x7 helps you to be one. Gone are the days when businesses, be it small or large, used paperwork to do any business related activities. Every single enterprise has its own website now. A typical Web Hosting environment provided by Web Hosting Service Providers for small businesses has lots of websites sharing the same physical host. Lets say you are a Web Host having three physical servers to provide the website content of 50 customers, i.e. 50 domains have their website content served by three physical servers. These three servers are load balanced for high availability. It is a hard task to monitor the performance of the 50 websites and the three servers. But, with Site24x7 it is not. This article points out the major issues you would face and explains how Site24x7 can help in eliminating those issues. Key issues you would face. Malfunctioning of websites in a particular geographic location. Issues that the Internet Service Provider (ISP) has in accessing the data centre. Inaccessibility of the websites on any of the 3 physical servers. How to eliminate DNS problems and IP issues. Site24x7's Website Monitoring helps to ensure that the websites are up and running at all times. The Site24x7 servers send out HTTP or HTTPS requests to the websites at regular intervals of time and alerts if it is down. Monitor those 50 websites from outside your data center to check whether they are resolving properly with no DNS problems and proper setup of IPs. Monitor each of those websites at a five minute poll frequency using any of the Site24x7 global locations. As a bonus, this also tests the load balancer and send alerts if there are any issues related to its functioning. How to eliminate location-specific problems and the issues faced by ISP. 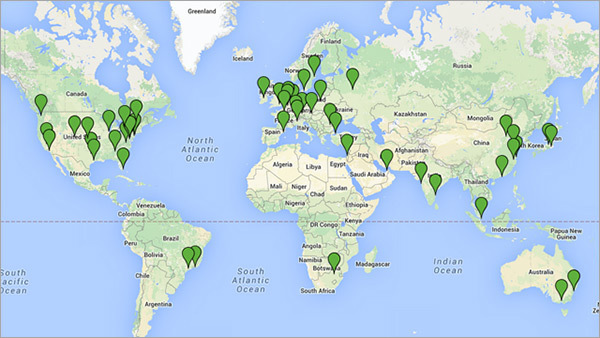 Site24x7 allows you to monitor websites from 90+ global locations. Check if all the 50 sites load from important countries/cities that they have visitors from. This is needed to make sure that there are no geographically related performance problems and no issues in ISP accessing the data centre. Receive alerts if the websites are down in any of the global locations. How to eliminate inaccessibility of websites and server outages. For optimal performance and uptime, the websites must be accessible on every configured physical server. Thus the three servers should be monitored. Site24x7's Server Monitoring does it for you. Monitor the performance of your servers and experience deep visibility into CPU/memory/disk usage. Uncover server outage cause in no time and thus ensure the accessibility of the websites on all the three servers. Install a Site24x7 Server Monitoring agent for Linux/Windows and monitor the URLs of all the sites on a particular server.This gives you ultimate uptime monitoring capabilities. Get it right with Site24x7. Site24x7 helps you to provide an efficient Web Hosting environment to your customers and give them a 100% satisfaction guarantee. Set up your account with Site24x7 and choose your plan according to the requirements and be the best Web Host. What are you waiting for? Sign up and get started.